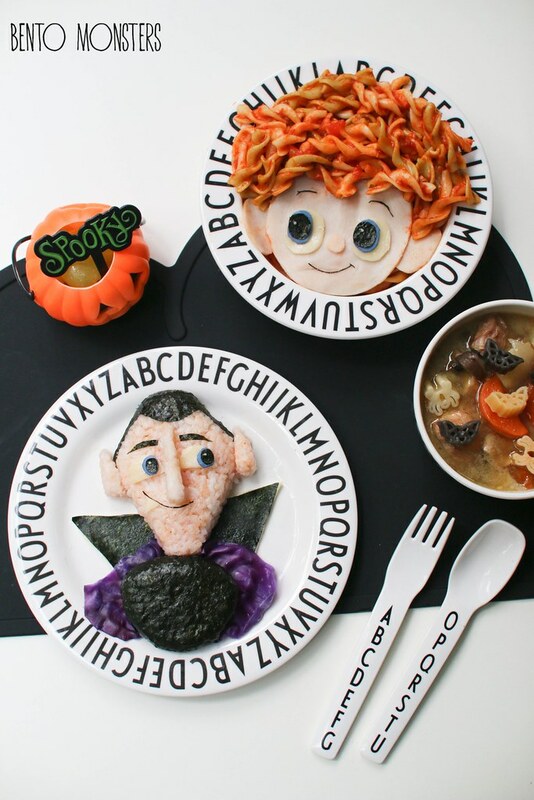 It's that time of the year for making Halloween bentos again. I've made many Halloween bentos during the past few years, you can check out all my past creations over here. I probably won't be making that many this year, as I'm don't blog that often like I used to these days, and I am afraid I won't be able to update in time if I make too many. 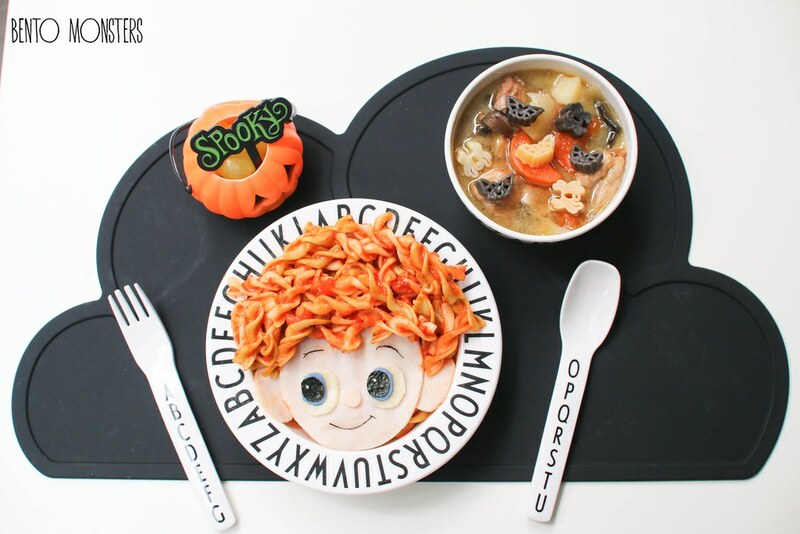 My first Halloween creation for this year is about the upcoming movie Hotel Transylvania 2. 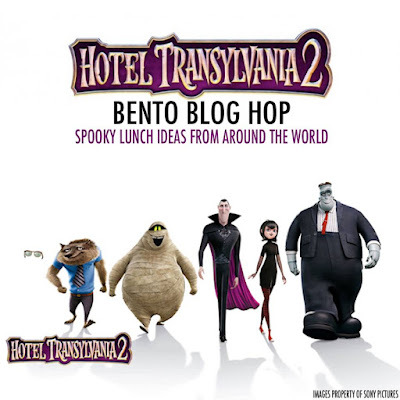 I'm joining a Hotel Transylvania 2 blog hop with my fellow bento friends, so please remember to click on the graphic at the end of the post for more Hotel Transylavania 2 inspired lunches. I love the new character in Transylvnia 2, Dennis, the son of Johnny and Mavis. Dennis looks so cute in the trailer, so of course I chose to craft him. I made his grandpa, Dracula too, because I like the posters showing both of them together. 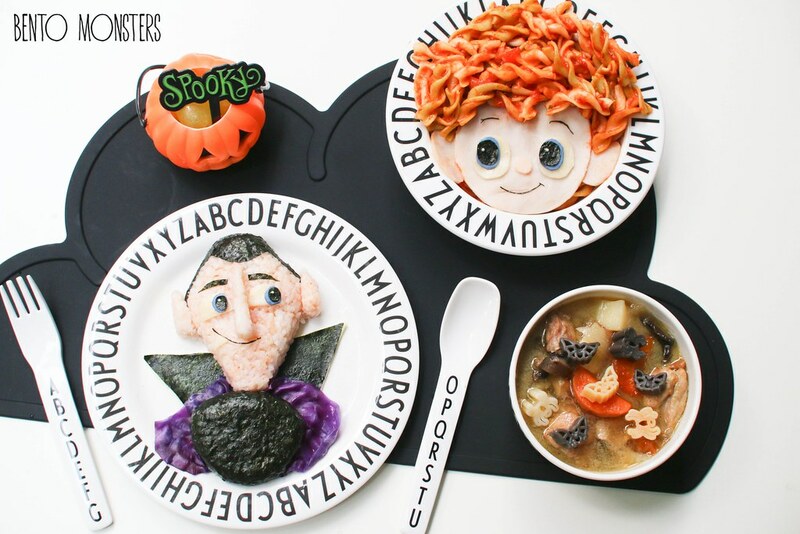 This is actually lunch for two, LT ate the Dracula rice with with his soup, and IT gets to eat his soup with Dennis pasta(There's another bowl of soup not in the picture.). IT likes to eat pasta and LT likes to eat rice. They don't usually get to choose at home, so both would just eat whatever I serve on the table. The soup is chicken vegetable soup which went well with both rice and pasta. 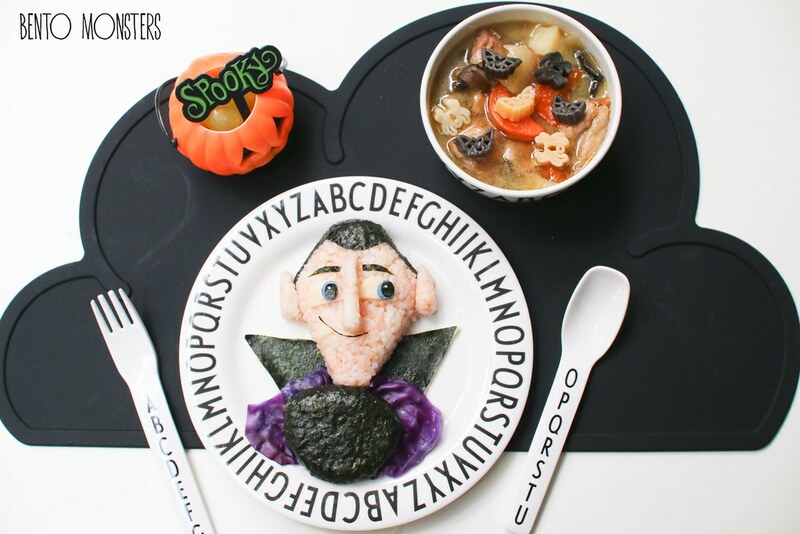 To make Dracula, I used rice(coloured with ketchup), nori, cheese, ham(coloured blue by soaking in butterfly/blue pea water) and red cabbage. 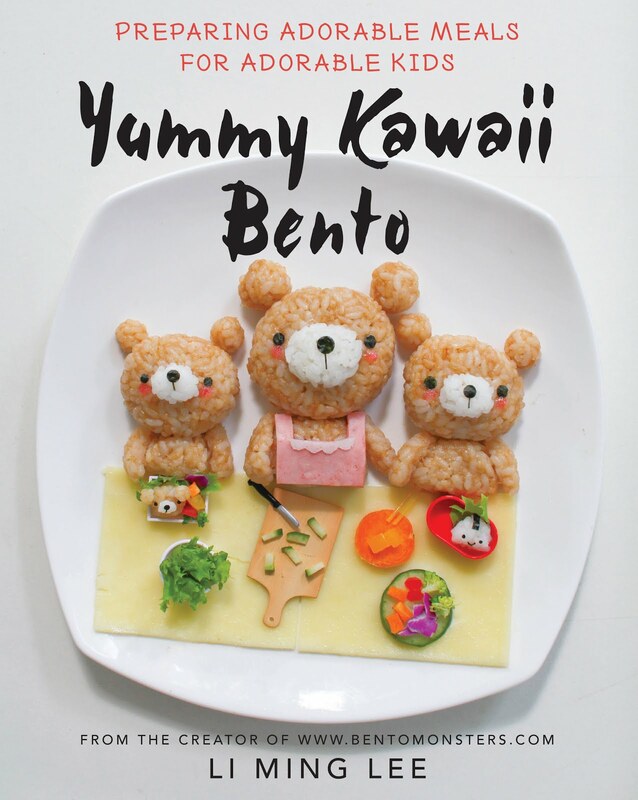 To make Dennis, I used spiral pasta (cooked in tomato based sauce), ham (eye portion was coloured blue using butterfly/blue pea flower waer), cheese and nori. I think Dennis still looks like he can do with more hair, I should have added on more pasta, lol. These are spot on for the characters. Well done! Adorable! They are spot on. I am forever amazed at anyone who can skilfully use the difficult pastas like rotini! So adorable. I love them both, SUPER cute! Every detailing is fantastic and creative!